Korea’s national dish, kimchi, is a spicy, pickled cabbage that is served as a condiment with almost every meal. Kimchi stew (kimchi jjigae or kimchichigae) combines kimchi with other ingredients such as beef, onions, garlic, and tofu and is served bubbling hot. Fiery, hearty, and full of flavor, kimchi jjigae is great for cold winter days, but Koreans can eat it anytime, anywhere. 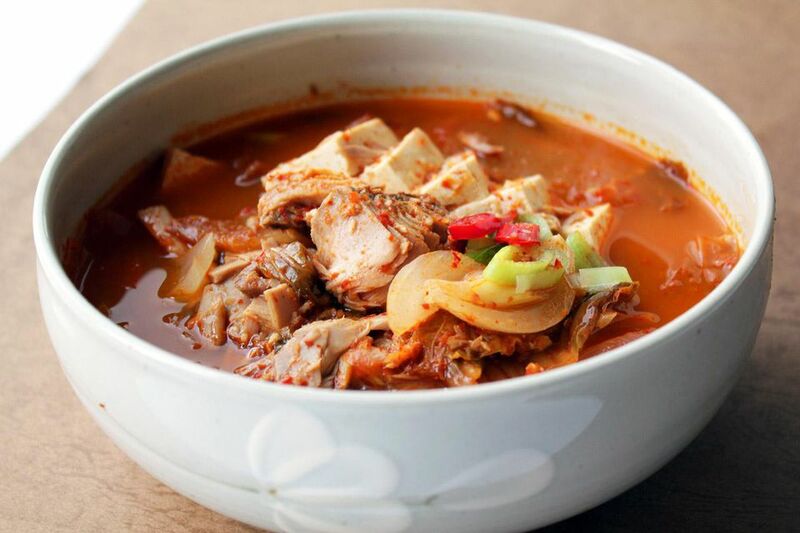 It's one of the most popular stews in Korea and is featured at many meals and in traditional restaurants. There's just one thing to keep in mind when you're planning to make kimchi jjigae—it is spicy. Really, really spicy. Sauté the beef in 1/2 tablespoon sesame oil in a soup pot for a few minutes. Add kimchi to pot and stir-fry for about 5 minutes. Add remaining oil, onion, garlic, kochujang, kochukaru, and soy sauce, mixing to combine. Pour the water into the pot and bring to a boil. Reduce heat to simmer. Cook for 20 to 30 minutes, adding the tofu after the first 10 minutes. Add the scallions at the very end. Serve this stew immediately after cooking, accompanied with steamed white rice. When choosing beef for this recipe, tenderloin is best, but you also can use tougher cuts like stew beef and simmer the stew longer. The stew makes good use of leftover or older kimchi, which can last indefinitely in the refrigerator; it's better to use older kimchi since it will have a more pungent, richer flavor to lend to the other ingredients. Younger kimchi may not add that richness, although some people may prefer it. Expect to sweat a bit, and make plenty of extra plain rice to counteract the heat factor. Kimchi jjigae is intended to be eaten slowly, with lots of rice as an accompaniment. Some common vegetable additions include potatoes, zucchini, and mushrooms. If you want a little extra bulk, consider adding glass noodles to your stew. This recipe calls for using beef, but you can also incorporate pork or canned tuna. The types of pork that work best are bacon, pork belly, or Spam; If using pork, you can halve or omit the oil. If you're using canned tuna, add it along with the onion and garlic.